Geomaterials, particular rocks, are multi-scale and multi-physics in nature (Figure 1). Dual Lattice Model (DLM) is a novel technique which involves coupling the solid lattice system and the fluid lattice system (Figure 2) to model the multi-physics problem. 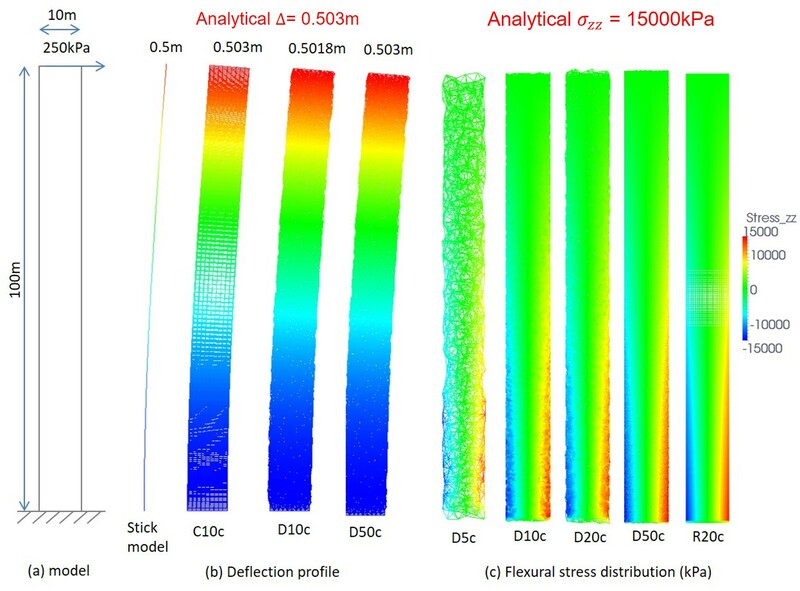 DLM is capable of modelling the fracturing process in multi-scale heterogeneous material, in particular, highly challenging hydraulic fracturing problem. Figure 3 shows the basic elements of DLM: cells, lattices and nodes. A 3D solid material is sub-divided into cells by Voronoi tessellation. 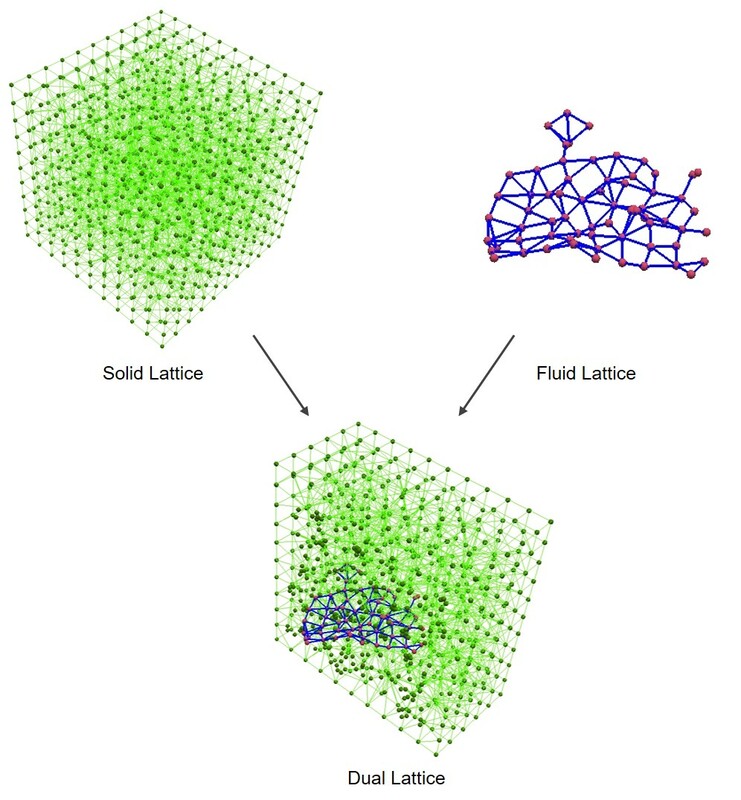 Solid lattices are a 3D representation of the solid material while the fluid lattice is a 2D representation of the fracture flow. The model simplifies a 3D multi-physics problem into 1D lattice network. 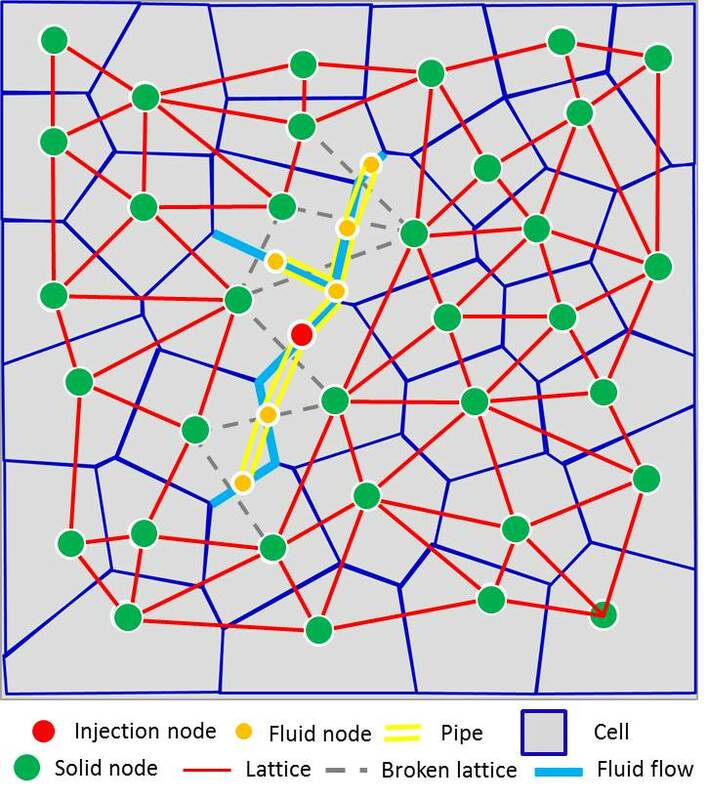 The fluid and solid lattice networks are fully coupled and geometrically inter-dependent (Figure 4). The fracture surface, which is solid cell facets is represented by fluid node and their conductivity by fluid lattice. By such simplification, it has the capacity to handle multi-scale simulation. 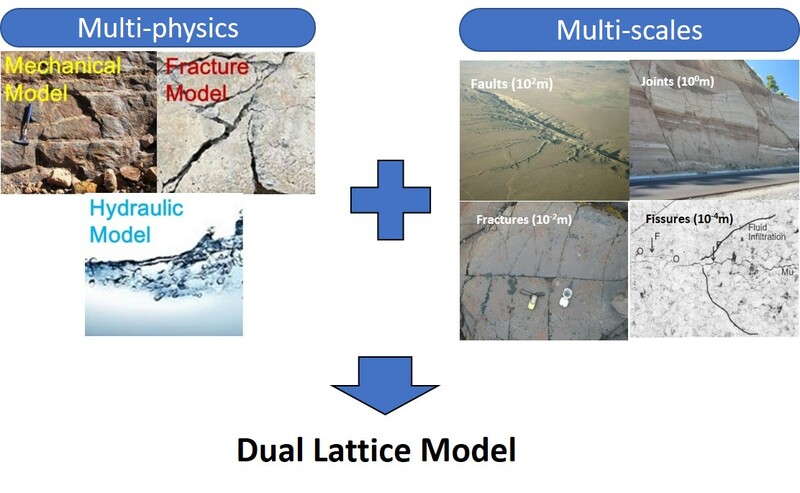 As a discrete model, DLM is suitable to represent heterogeneous material and modelling processes which are disorder in nature, such as fracturing. 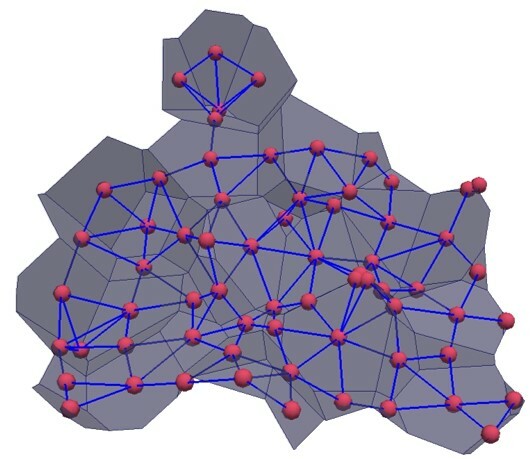 Statistical distribution of material properties can be specified based on test observations such as acoustic emission in laboratory scale and micro-seismicity in field scale. In a continuum model, there are several parameters that describe the homogenised constitutive model, however it is not sufficient to describe the heterogeneous material behaviour. Also, continuum model is limited by its ability to handle complex fracturing processes. 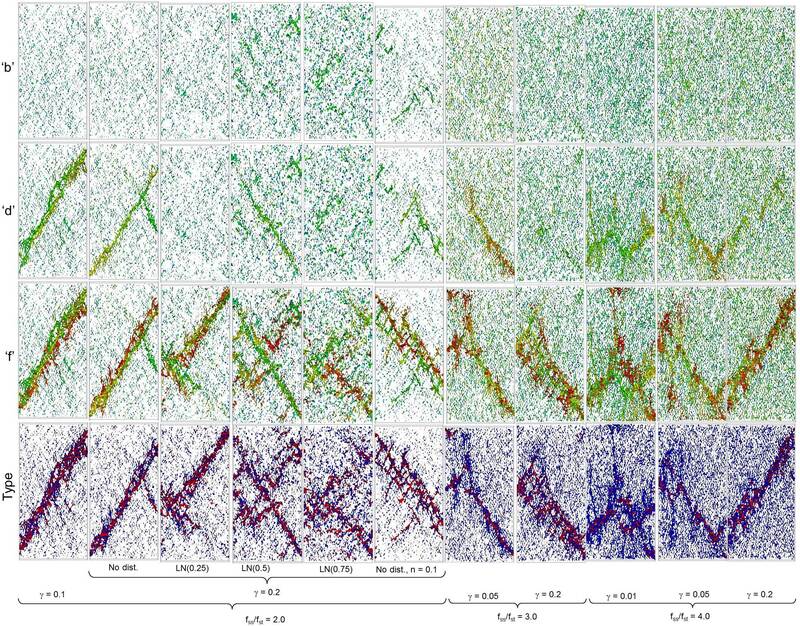 Pre-processing module: has the capacity to generate disorder lattice network, applying heterogeneity by including fractures and applying statistical distribution on lattice parameters. A solid module: modelling deformations of lattice model and fracturing process. Coupled Solid-Fluid module : coupled fluid calculation using cubic flow law. Post-processing module: Graphical output and statistical analysis. 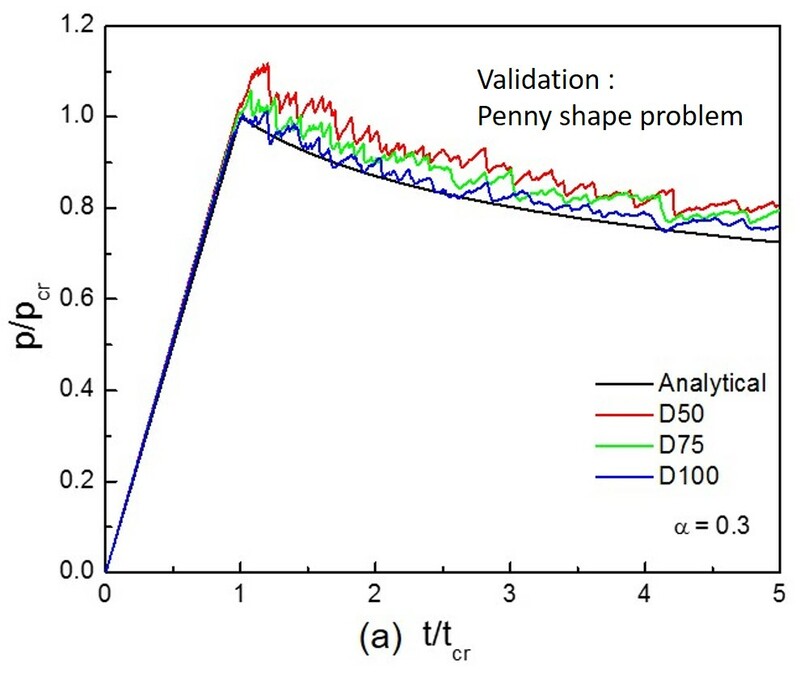 The solid lattice module has been validated by cantilever problem (Figure 5) and the penny shape problem (Figure 6) for coupled solid-fluid module. A parametric study of the fracturing process of heterogenous model is also carried out (Figure 7). A highly efficient parallelised preconditioned Conjugate Gradient Method which has capacity to handle millions of DOF problem in desktop computer, with future potential for large-scale simulation in High Performance Computer Utilising clusters of CPUs or GPUs. The solid-fluid coupling problem is handled by sophisticated numerical scheme for fast and stable solutions. DLM offers the ability to perform large-scale 3D simulations without expensive computational effort. DLM also enables realistic modelling of field scale problems with adequate details for practical applications including but not limited to hydraulic fracturing. 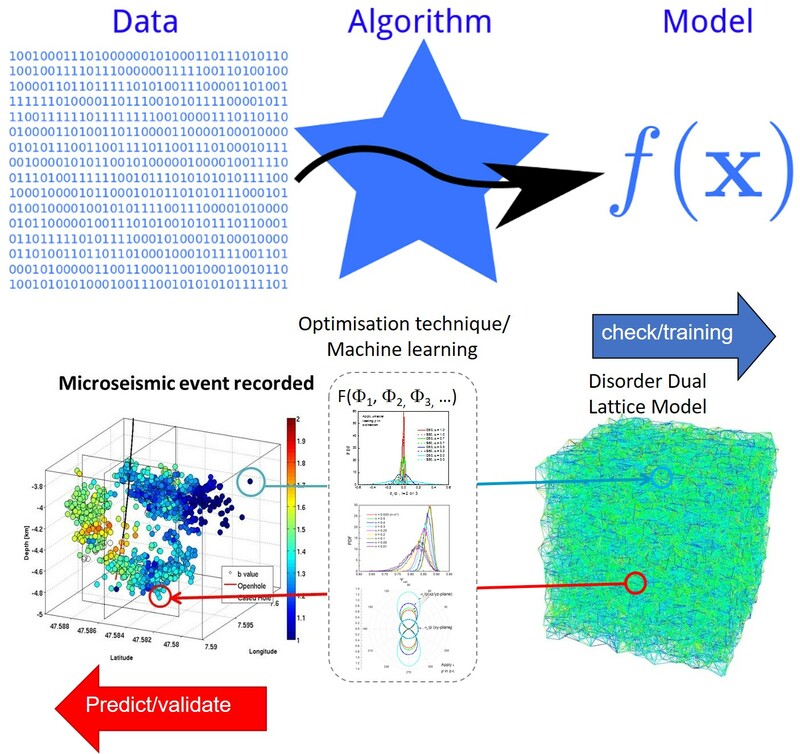 By the advancement of computation power and rapid development of Machine Learning and optimisation algorithms, field data can serve as training data and produce an evolving model for better accuracy and provide predictive power which is the industry need (Figure 8). J.K.-W. Wong, K. Soga, X. Xu, J.-Y. Delenne, Three dimensional hydraulic fracturing simulation using Lattice Element Method. Proceedings of ISRM 13th International Congress on Rock Mechanics, Montreal, Canada, 2015. J.K.-W. Wong, K. Soga, X. Xu, J.-Y. Delenne, Modelling fracturing process of geomaterial using Lattice Element Method. Proceedings of International Symposium on Geomechanics from Micro to Macro, Cambridge, United Kingdom, 2014. The research project is funded by UK EPSER I-CASE Award with the industrial partnership with Arup London and HKIE Young Engineers Arthur & Louise May Memorial Scholarship as PhD project of John Wong. The contributions from Prof. Farhang Radjai and Dr. Jean-Yves Delenne of Université de Montpellier are duly acknowledged for suggesting Lattice Element Method, and laying the foundation of DLM during their visit at University of Cambridge. Mr. Duncan Nicholson and Mr Anton Pillai of Arup London are also acknowledged for bringing their industrial perspectives for potential applications of DLM. © 2019 CB-Geo - Computational Geomechanics Research Group.